The various different launchers available for Android devices certainly go great lengths to improve the customization and functionality of the world’s most widely-used mobile platform. Here at Redmond Pie, we cover many variations of launcher on a weekly basis because we strongly feel that we should, and while most are fairly good, like a lot of software out there, there are sometimes aspects you would like to change without compromising the entire launcher. The homescreen is one of the most altered aspects of an OS, whether on mobile or on a desktop. Seeing as it’s the most commonly viewed area, this makes sense, and Desk Migrate by Lucky Art allows Android users to copy homescreens from one launcher to another, by following a simple process. Emphasis on the word, simple. Of course, once you’ve installed Desk Migrate, you’re probably going to need some launchers to chop and change. If you’re a not-so-secret iOS fan wielding an Android tablet, you may like to check out Espier Launcher HD, which gives your device that iPad-esque homescreen layout. If your device is still rocking the old Gingerbread (many of you, I would imagine), then you can give your device an Ice Cream Sandwich makeover without actually updating your software version with Phoenix Launcher. Apex Launcher offers a powerful and highly-customizable homescreen replacement for Android 4.0+ ICS devices, and we’d also encourage you have a look at Nova Launcher, which, with a host of features such as custom grid, infinite scroll, and gestures, is certainly one of our favorite ICS home launchers. Apps like Desk Migrate make an already versatile platform just that bit more joyous to behold, and to top things off, it’s free of charge and available to download right now from Google’s newly-entitled Play Store. It managed to get a rating of 4.2 out of 5 from three-and-a-half thousand votes, so download from the link below, and feel free to offer your own critique by dropping a comment on our Facebook or Google+ pages. 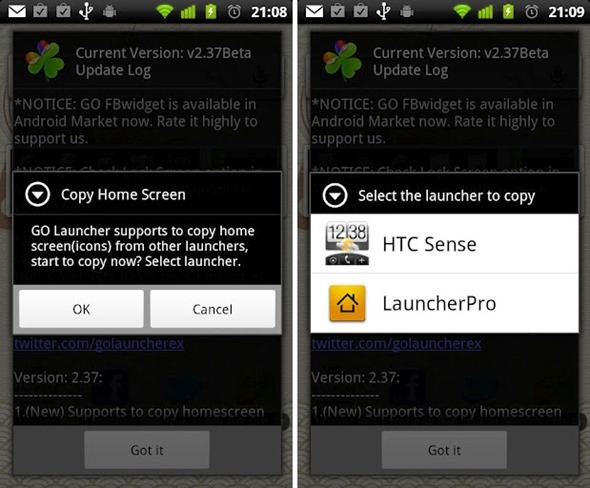 GO Launcher EX 2.85 Beta Released: Test New User-Interface And Experience Features Before Mass Adoption!